Our neighbor Richard, at the market this morning, enthused about the sound of swifts round the barn and the big blue sky. On the drive home a hare peeked out to sniff the air–checking on Spring and whether it was safe to cross the road. The bees are buzzing and beginning to busy themselves around the Judas tree. The donkey up at the farm just eee-awed. The walnut trees are leafing out at last. Something is happening here (and you don’t know what it is–do you Mr Jones! *)–and it’s about time! 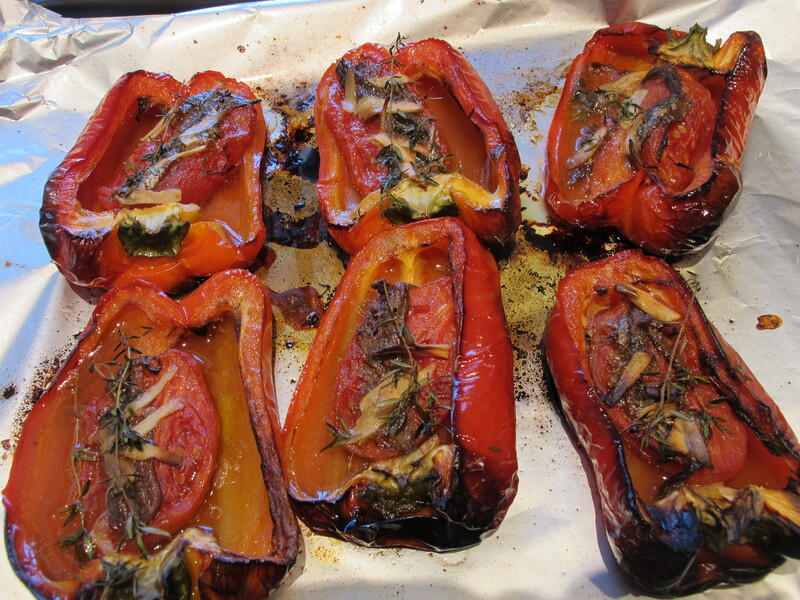 A good day–perhaps–to tempt fate with an early summer lunch dish–roast red pepper halves. I see they featured just over a year ago with chèvre(goat’s cheese); todays’ will be with the thinnest slivers (easier to do than say fast!) of garlic and anchovies, melting into the tomato juices. 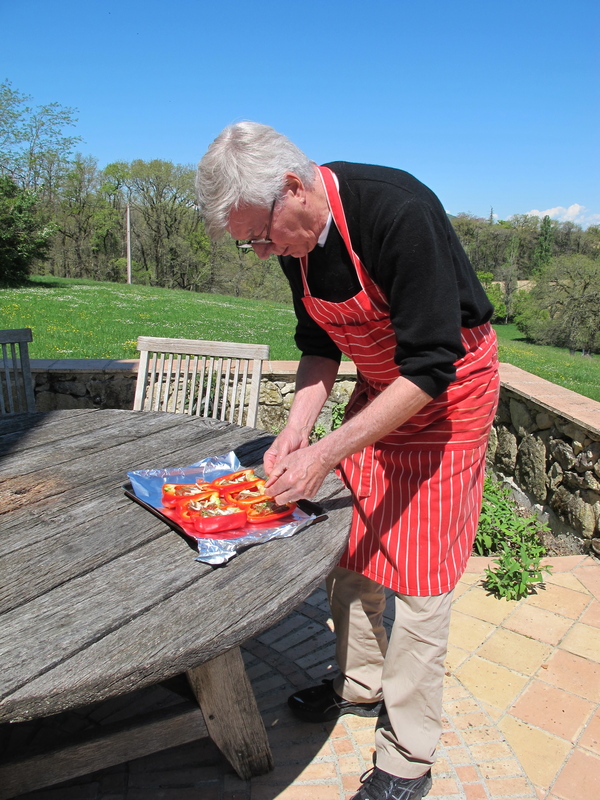 Cover a baking tray with foil–(saves time scraping after the tray has been in a hot oven). Brush with olive oil to avoid the peppers sticking. 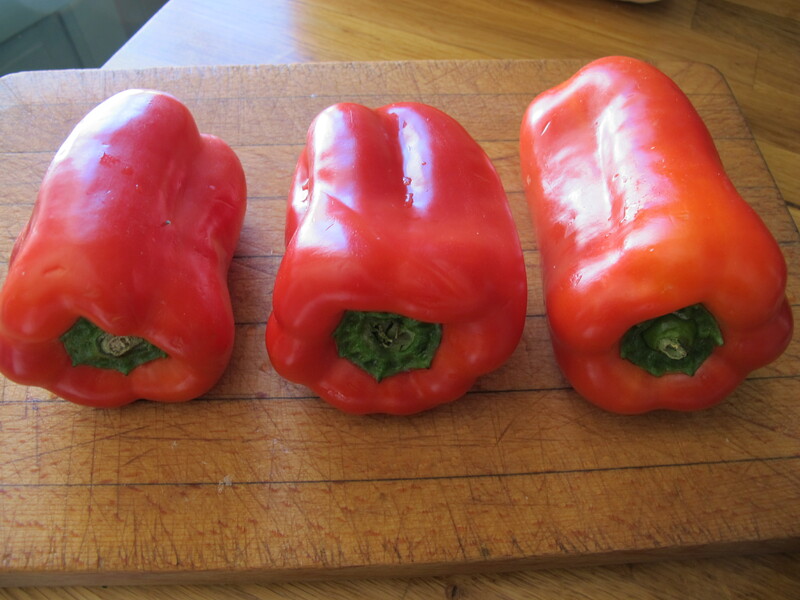 Place the peppers side by side on the tray. 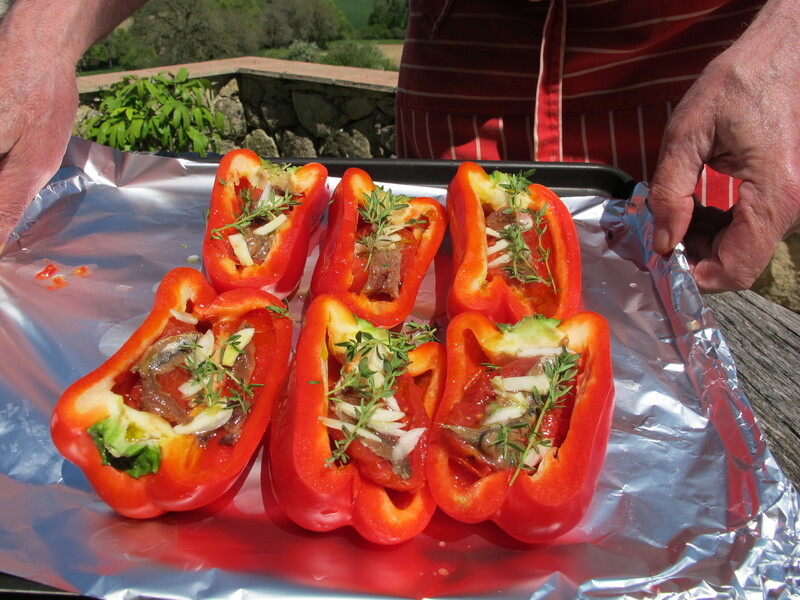 Fill each half with tomato pieces, three or four slithers of garlic and an anchovy fillet on each. Drizzle a tablespoon of olive oil over each half. Bake in the hot oven for 3/4 hour–checking after half an hour–but they need to be thoroughly tender to be delicious. And a simple green salad to serve. 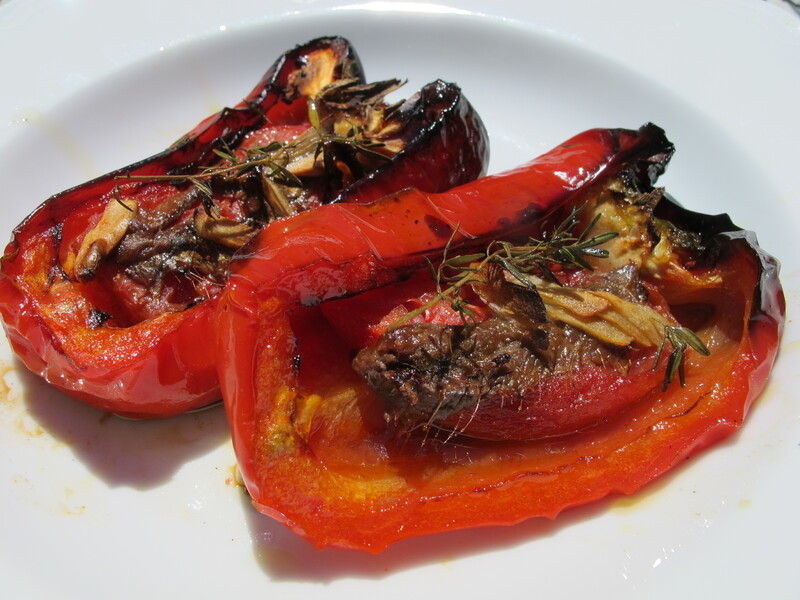 The roasted red peppers have gotten to be a favorite from your book. I was planning on having them again this week, cooked on the outdoor grill as we are expecting good weather. I’m thinking some smoked salmon and queso fresco with coriander seed might go well. I love that you can make so many variations with this dish. Umm…Love the sound of this. What happened to the anchovies, Robin? Did you change your mind? Another possible variant would be to use a thin slice of Parma ham instead of anchovy, though I am not sure if this would respect the diabetic cuisine ethic. I’ve made something similar to this before with Parma ham and it is delicious. Though I must say your variation with thyme and garlic slivers sounds even better, Robin. Thank you! And I hope your return to the kitchen means that you are feeling well again! I am thank you. You’d have to add the parma half way I reckon–sounds good though. You were absolutely right to question the cooking time for the ham. I checked the notes I made in the recipe I adapted and in fact the ham needs to be added just for the last 5 minutes of cooking time. It gets very slightly crispy and the flavour blends nicely into the other ingredients. Also as the ham is salty, you probably don’t need to add further salt. Voilà! You look dignified whatever you do. You look elegant whatever you wear. And that is the truth.